SUNNY BRAE – Saturday night’s hot Arcata ticket is in Sunny Brae – a pleasant outdoor film viewing at Bayside Park Farm. Your Bayside Park Farmers invite you to come down to the farm for the monthly Flicks on the Farm free outdoor movie series. 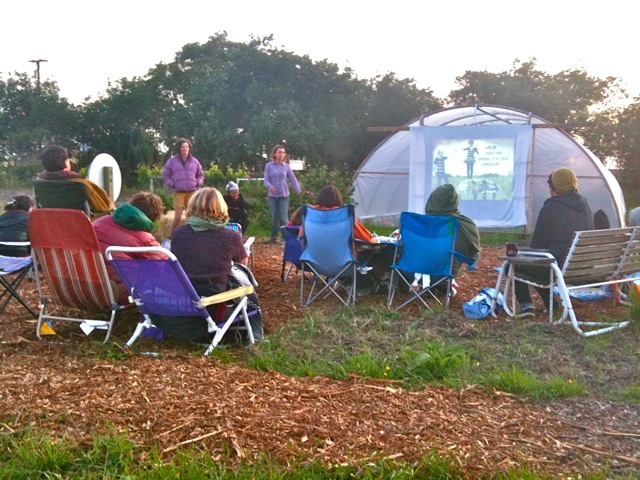 July’s film offering, Food Matters, will play after sunset on Saturday, July 14 at 930 Old Arcata Road in Sunny Brae. Food Matters examines the impact the food we eat has on our health and the environment. The film takes a close look at the raw food movement, organic agriculture and nutrition therapy. Filmgoers are encouraged to arrive at the farm by 8:30 p.m., dress warmly, and to bring snacks, a lawn chair or blanket and a small flashlight. Hot tea and popcorn will be available for a small donation. Bayside Park Farmers invite you to a composting workshop on Sunday, July 15 at 11 a.m. The farm is located at 930 Old Arcata Road in Sunny Brae. Workshop instructor Michael Kosaki will teach gardeners and home farmers how to build their own compost tea brewer out of easy to find materials, give a brief overview of various composting methods and dive into what makes up a healthy soil. The workshop is free to all students with a valid Humboldt State University or College of the Redwoods ID card. A $20 donation is suggested for other community members. The workshop will last about four hours and attendees are encouraged to bring a snack and a water bottle. For more information about the workshop and Bayside Park Farm, call Farmer Leandra at (951) 258-4609, or e-mail baysideparkfarm@cityofarcata.org. This entry was posted on Friday, July 13th, 2012 at 8:23 am	and is filed under Community, Environment. You can follow any responses to this entry through the RSS 2.0 feed.